This new chapter provides novel and important insights into weight gain. It explains how and why eating the wrong foods causes toxic hunger and the desire to over consume calories. Whereas a diet of micronutrient rich food causes true hunger which decreases the sensations leading to food cravings and overeating . It instructs readers on how to leave behind the discomfort of toxic hunger, cravings, and addictions to unhealthy foods. This is a book that will let you live longer, reduce your need for medications, and improve your health dramatically. It is a book that will change the way you want to eat. Most importantly, if you follow the Eat To Live™ diet, you will lose weight faster than you ever thought possible. 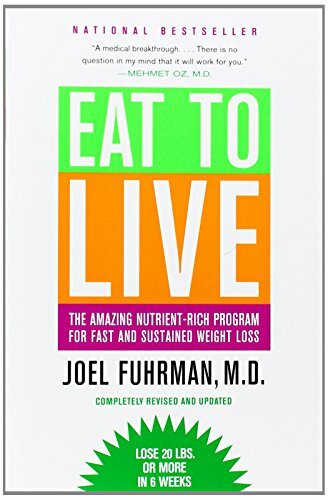 Product Description: The Eat To Live 2011 revised edition includes updated scientific research supporting Dr. Fuhrman's revolutionary six-week plan and a brand new chapter highlighting Dr. Fuhrman's discovery of toxic hunger and the role of food addiction in weight issues. This new chapter provides novel and important insights into weight gain. It explains how and why eating the wrong foods causes toxic hunger and the desire to over consume calories; whereas a diet of high micronutrient quality causes true hunger which decreases the sensations leading to food cravings and overeating behaviors. It instructs readers on how to leave behind the discomfort of toxic hunger, cravings, and addictions to unhealthy foods.